1. 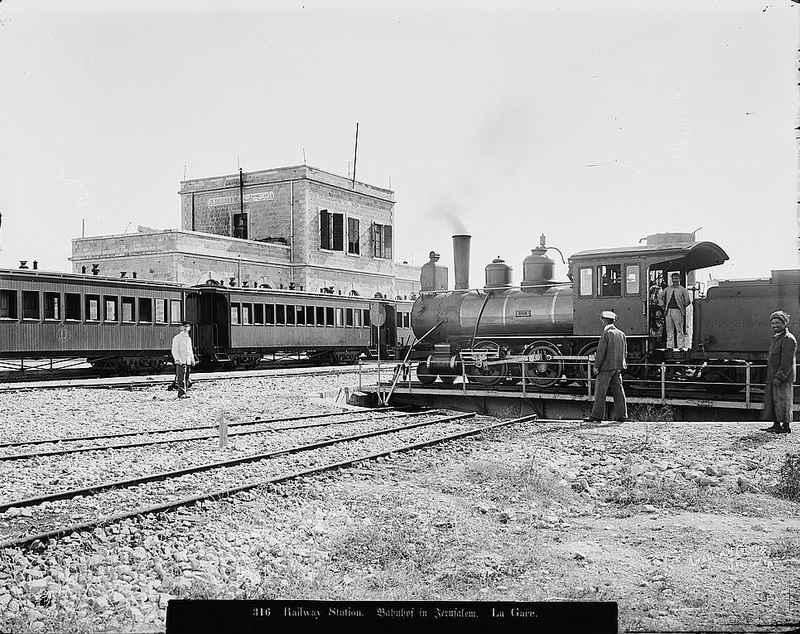 Ehud wrote, "You might note that the first train in the Holy Land was a Jewish initiative." Ehud, you're right. Here's an abstract of the article you recommended. Already in 1838, Jewish financier Moses Montefiore raised the idea of a train. He lobbied the British prime minister and the Ottoman grand vizier in 1856. A year later he brought a British engineer to Palestine to survey a route. After his wife died in 1864, however, Montefiore gave up his dream. 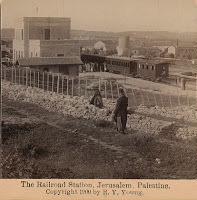 But the idea was kept alive by a Jewish businessman from Jerusalem, Joseph Navon, who in 1885 lobbied the Ottoman authorities to build the train line and secured funds to finance the construction. 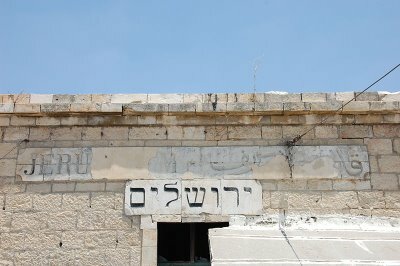 below (apparently added later, judging from the appearance), in Hebrew. Now, I see the picture with the English and Arabic names, but none in Hebrew, and my deduction was proved correct. Auguste Lumière and Louis Lumière were photographic inventors who began to experiment with motion pictures in the early 1890s. 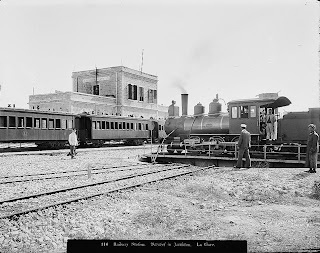 The Frenchmen's first footage was recorded in March 1895. In 1897, they produced the first motion picture made in the Holy Land, a 51-second film from a train leaving Jerusalem station. Click on the picture to see the film or view an annotated version of the film which answers the question, "Who were the residents of Jerusalem when the film was made?" Note in the background the windmill in the Jewish neighborhood of Yemin Moshe built by Moses Montefiore in 1860.